Are you an early bird? 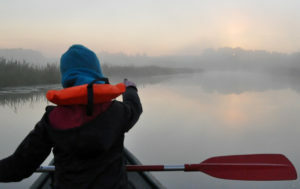 Then our ”Beaver & Breakfast” is a unique opportunity to experience the beautiful dawn! Just before sunrise we paddle quietly to the beaver’s realm. The night animals are taking a last meal, wash themselves and prepare for sleep, while the day animals wake up. This moment is one of the most beautiful times of the day! The upcoming morning light creates perfect conditions for nature enthusiasts and wildlife photographers. A pageant of unique moments within Svartådalens beaver realm. When the sun has risen into the sky we paddle back to the base camp. Here we offer you a delicious breakfast, cooked over an open fire. Good fried eggs with freshly brewed coffee makes this experience complete. During breakfast, we tell you about the beaver habita. Breakfast cooked over campfire is included! – We strive to supply locally produced food, giving you a taste beyond the ordinary. Max. 6 – 10 participiants. (minimal 2 participiants). Payment in cash or on your final invoice by IBAN-BIC. Every day during the spring, summer and during the beautiful fall season. 1 hour prior to sunrise (the trip takes 2-4 hours). To park your motor home or caravan, or putting up a tent, is free if you book our Beaver & Breakfast. NOTE: No camping facilities. What you can expect to see on your beaver tour? If these circumstances arise, you can cancel the reservation 48 hours before your arrival. There after accept we only re bookings. Book an accommodation at Eden’s Garden. If still available, you can select Bed Breakfast and self catering in our authentic 1700s cottage, or our vacation manor. Cycling, hiking, bird and wildlife watching, fishing, horse-riding, paramotor tandem flying, Eco forest and wildfire forest, golf, Frisbee-golf, historical sightseeing, shopping in Västerås or Sala, Sala Silvermines, Skultuna brassworks, Sätra Brünn Health Spa, etc etc. Come and experience all that the Black River Valley (‘Svartådalen’) has to offer. We strive to offer locally produced foods to add to your special experience in ‘Svartådalen’.